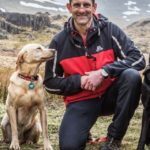 The Arran Mountain Rescue Team (AMRT) are this years recipients of the Margaret Kay dog class donation in recognition of their dedication and committed work. Each year Margaret, who runs dog training classes in Whiting Bay, distributes what surplus monies she has raised to local charities. Having previously made donations to the RNLI, Montrose House Sunshine Fund and AMRT, along with regular beneficiary, Whiting Bay Hall, it was decided that the entire amount would go to one deserving group. Margaret said: ‘This year our decision as to where our monies would go coincided with Mr Leask going missing and the huge, multi agency, searches around Whiting Bay and Lamlash. 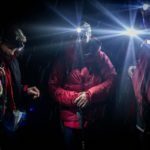 ‘We decided to donate all of our funds this year to the Arran Mountain Rescue Team – we appreciate that they were not alone in the searches, but felt the other agencies were larger charities who could, perhaps, command larger donations from a wider source’. 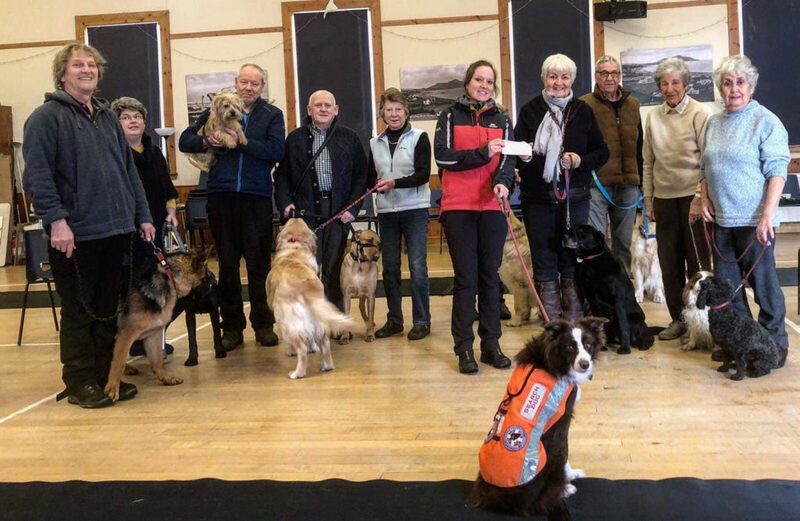 Kirstie Smith from AMRT visited the class with Caileag, her SARDA search dog, where she was presented with a cheque for £500 on behalf of the club in appreciation of all that they do. Incidentally, Caileag’s first foray into training was at Margaret’s class in Whiting Bay. 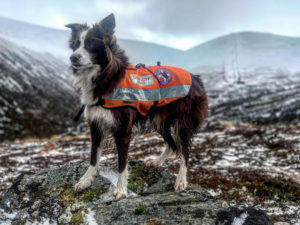 Caileag the SARDA search dog plays a vital role in the AMRT.